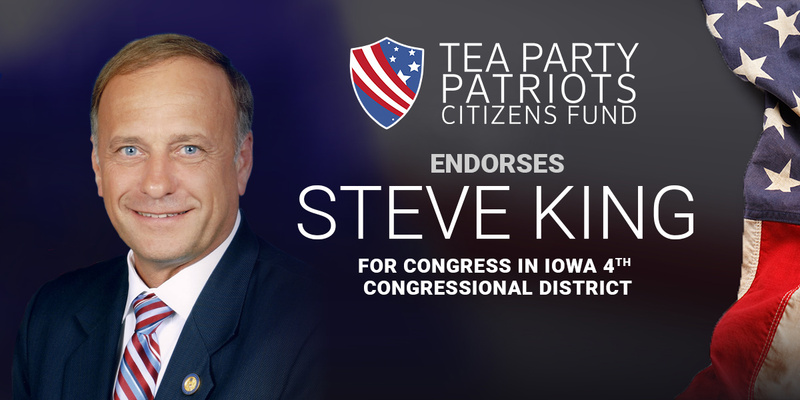 ATLANTA, Ga. – Tea Party Patriots Citizens Fund (TPPCF) Chairman Jenny Beth Martin today released the following statement, announcing that the Super PAC associated with the nation’s largest Tea Party group has endorsed Steve King for Congress in Iowa’s 4th congressional district. “For conservatives in Iowa’s 4th congressional district, the choice is clear – Steve King for Congress. “Since coming to Congress, Steve has been a strong constitutional conservative. No matter what the issue, Steve has always cast a conservative vote. “He has been a leader in the fight to repeal ObamaCare, to secure our borders, to reform our immigration system, and to stop spending more money than we have. “Steve has worked closely over the years with Tea Party Patriots and other like-minded groups of concerned citizens. His commitment to personal freedom, economic freedom, and a debt-free future rivals our own.